It is copyright © Ian Keenan and Jacket magazine 2009. See our [»»] Copyright notice. Adorno argued that neither the meaning nor the structure of the poem contain the truth content, (16) accusing Heidegger of “relocating Hölderlin… within the genre of philosophical poetry of Schillerian providence, ” (17) and of putting ontological ideas in Hölderlin’s mouth. (18) The defense that Heidegger “touches both sides of the limit” of the poetic and metaphysical, from Derrida (19), and that “Heidegger subtracted the poem from philosophical knowledge to render it to truth”(20) while for Plato the poem was “a seduction diagonal to the True”(21), from Alain Badiou, attests to the impact Heidegger’s interpretation of Hölderlin’s methods have had on French poetry since the Second World War. André du Bouchet’s poems utilize natural and conceptual imagery to shift frames of reference within an unconventional grammar rather than following a conventional sentence with a non sequitur, a method of parataxis owing more to Hölderlin than Pound, whom du Bouchet was quite familiar with. Ron Silliman, 1976, None of the Above anthology. The assertion “any other tendency now is mere decoration” preceded the diplomatic receptiveness of his later years, but it confirms the clarity of a set of convictions that he would hold to in broad strokes to the present day. This was not a ‘here today, gone tomorrow’ manifesto, but an overview of a mission which would be illustrated in the particulars in his critical essays, his influential blog, and well over a thousand pages of poetry. The riposte to Projectivism and self-dramatization of the New York School focused more on opposing second generation imitators of “inherited forms”, but the original tenets of these traditions are nonetheless in view. The verb tense of the statement tells the story on one level: “1970” demarcates the time when content became exhausted, the “reinvestigation of the whole act of writing” is necessitated by a moment prepared by Coolidge and Grenier, who famously declared in print his hatred of speech in 1971. But that statement at the time was nonetheless directed at Olson and Creeley’s belief that form is an extension of content, as well as the foregrounding of persona and personal narrative of the New York School. These tensions would always animate Silliman’s conflicted reverence for his forebears, informing the inspiration and development of his signature style in the coming years. The paragraphs resemble the synchronic, territorially decentralized collective characterization of Dos Passos and Sartre’s The Reprieve, enabled in part by increased awareness of the world through mass communications, and the following of the observation of “Fountains of the financial district” with imagined houseboats recalls the Wallace Stevens-based juxtaposing of the ordinary and the exotic in John Ashbery’s imagining of Guadalajara in 1956’s “The Instruction Manual.” The second line of the poem reads: “Revolving door. A sequence of objects which for him appears to be a caravan of fellaheen, a circus, begins a slow migration to the right vanishing point on the horizon line.” This would appear to be a similar strategy of paring the familiar and the exotic, but Silliman says in a later interview that the caravan is a metaphor for progress. If he’s correct about that, it is telling what happens to this vision of progress in subsequent lines. After concluding the second, third, and forth lines, the description of fellaheen, tigers, dromedaries, and ostriches is followed in the fifth line by “We ate them.”(36) In the sixth line, a border is drawn after the caravan: “The implications of power within the ability to draw a single, vertical straight line.” Later it’s cut off by “Slag iron,” “I want to tell you the tales of lint,” “Refuse connectedness,” “Here is Spain, there is Africa, this the water,” and “Words I wrote in the control room of the Pacific Rim,” but mostly this image of progress disappears in an sea of signs, a single 47-word sentence in a fifty page line, perhaps a myth disappearing into its realization. Silliman gave a reading of Ketjak at the corner of Market and Powell Streets in San Francisco for four and a half hours, spitting blood and losing his voice afterwards for three days, saying later that Ketjak “is so thoroughly involved with street language and found language, and that corner is where all the street preachers come to harangue in San Francisco, that my reading was a way of returning that language to its source.”(39) The contrast with Projectivism and the New York School is seen acutely here: SPACE is not the central fact but rather the abundance of found language and precariously linked images within space; the subject is not the emotion or social circle of the poet but the external world absorbed by the poet. This stunt aside, Language poetry was initially composed for an audience of each other, and the social lives of its poets is the subject of the collective autobiography The Grand Piano, reconfigurations of “incessant gossip” befitting their wish to move from the confessional to an engaged artistry. The involvement with “street language and found language” amid a discarding of works unified by confessionalism, spiritual cosmology, charting of the inner self, narrative, utopian allegory, and topical poetry influenced the New York-based Flarf movement, which Silliman later came to support critically, using the computer search engine to make a patchwork out of harangueing in which the poet has an undefined, ironic relation to what is said from line to line. All those discarded models could exist thereafter, as long as one is quickly interrupted by another. 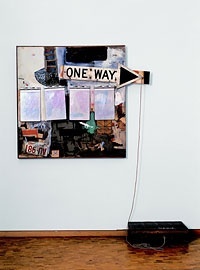 Robert Rauschenberg, «Black Market», 1961, 127 x 150.1 x 10.1 cm. Oil, watercolour, crayon, printed paper, printed reproductions, wood, metal, metal box and four notepads on canvas, with rope, rubber stamp, inkpad and various objects. The growth of sentences like trees in Ketjak postponed what would become one of the hallmarks of his later work: the total manipulation of the juxtaposition of seemingly unrelated sentences found in The Alphabet. “The Chinese Notebook,” which reads like a parody of Wittgenstein’s Tractatus, comprised entirely of different modes of aesthetic commentary and asking the reader at one point “Why is this work a poem?”,(40) moves partially in this direction, but plays at determining linkages by instructing the reader to compare one line and another, and explaining “When I return here to ideas previously stated, that’s rhyme.”(41) Noting the painterly equivalent to his departure from Stein’s Cubist-era restricted vocabularies and Coolidge’s Abstract Expressionist non-referentiality (42), he suggests “One can use the inherent referentiality of sentences very much as certain “pop” artists used images (I’m thinking of Rauschenberg, Johns, Rosenquist, etc.) to use as elements for so-called abstract composition.“(43) The signified isn’t so much rejected as is its use value, in agreement with Adorno’s analysis of Hölderlin. As with Ketjak, Tjanting utilized repetition of some of its short sentences in subsequent paragraphs expanded by a Fibonacci sequence to form pebbles on a vast beach traversed by its intrepid admirers. Aside from the noun assemblage “Sitting Up, Standing, Taking Steps” (“a true noun, an isolated thing, does not exist in nature”-Fenollosa (44)), Silliman’s use of numbering systems still faintly resembled other poets’ use of closed forms, to structure the depths of the mind. Perhaps to overcome this, he turned from explicating his memory, literary referencing and thought processes to focus on his sense perception and visual experience, having read around that time Benjamin’s essay about Baudelaire the flâneur. On September 6, 1976, he boarded the Bay Area Rapid Transit train late in the morning and began writing down his perceptions for over five hours. This produced the eleven page poem BART, a visual diary which returns us to Simmel’s public conveyance where images and the Frank O’Hara-style narration of the author’s movements are linked with each other using commas, rather than joined with semicolons to floral metaphors. To Viktor Shklovsky’s statement that “Art was always free of life, and its color never reflected the color of the flag that waved over the fortress of the city,”(45) Leon Trotsky responded that “city culture has struck the eye and ear of the poet.”(46) After allowing the people in the city on Labor Day to determine the form of his 11-page sentence, Silliman looked above them for the content which would commence work on his 1,055 page, 26 section A-Z poem The Alphabet. This section, Skies, documents his sense perception beginning with a visual accounting of cloud formations which, as with BART, comes to illustrate the passage of an increment of time. The use of the plural in the title suggests that perceptions are what’s being represented, because the actual sky being perceived is singular. Though this followed Zukofsky’s pronouncement that “the natural human eye is OK, but it’s the erring brain that’s no good,”(47) Calliope waited patiently on Parnassus for Silliman to return to the epic of his erring brain. Silliman returned to the letter A, took the quotation marks off it and inserted the place of his childhood, Albany, a two page poem that begins “If the function of writing is to “express the world,”(48) and then describes his parents and grandparents, mixing sentences that appear to be autobiographical with sentences that don’t appear that way. Blue and Carbon, also short poems, begin to set forth the template of the rest of the epic, as Carbon switches back and forth between prose and somewhat lyrical forms. The Alphabet swings into full gear with the humorous and expansive prose poem Paradise, perhaps the best starting point for the beginning reader, written while he was quitting drinking and dating Krishna Evans, with whom he would later start a family. Around the time he would get married he penned the sixty-page Lit, twelve sections which make use of a variety of structures based on the number twelve (49), and the 117-page What, written entirely in lyric form. Xing, another enjoyable starting point, refers to both “Cattle xing” at one point and several Chinese words that contain ‘Xing,’ but doesn’t mention the elephant in the room: Confucius’ use of the term ‘Xing’ to describe the effect that two separate images or narratives linked together have on a reader. The poem contains several sentences that describe flora. Trotsky’s 1923 examination of the Russian Formalists’ view that “Form determines content (Kruchenikh)”(59) criticizes the isolation of the linguistic from its determining social factors that Hegel had sought to integrate. Silliman’s culturally meaningful non sequiturs can be seen as accommodations to these criticisms of formalism, even if they were set in motion by not wanting to reproduce the non-referentiality and limited vocabularies of his poetic predecessors. Watten’s proposed name for their literary movement was Social Formalism. Creeley’s later statement that “content is never more than an extension of form” illustrated a change of his view seen in his progression to Pieces, not a retraction but rather an acknowledgement of the two statements’ compossibility. The images of Armantrout, whom Silliman considers one of the best poets in American history, often appear dimly or ironically through a filter through which they are perceived, be it mass culture, contemporary jargon, poetic convention, or related methods of disjunction or contextual shifts, resembling Barthes’ prescription for “Brecht’s formalism… in a still-alienated society, art must be critical, it must cut off all illusions, even that of ‘Nature’: the sign must be partially arbitrary, otherwise we fall back on an art of expression, an art of essentialist illusion.” (63) With the appearance of the confessional in “a surface conventionality” (64), Armantrout’s poems can be published in venues like The New Yorker and The Nation, publications that do not accommodate the surface appearance of “The Chinese Notebook” or Watten’s “Plasma,” containing the more expansive and explicit linkages of Althusserian overdetermination. 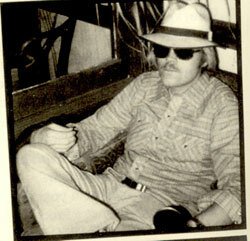 On August 29th, 2002, Silliman wrote in his first blog entry: “Blogs have been around for a while now, but to date I haven’t seen a genuinely good one devoted to contemporary poetry, so it may prove that there is no audience for such an endeavor.” He began writing theoretical notes and reminiscences modeled after Adorno’s Minima Moralia, chronicling the histories of the Actualist and Language movements and other trends of past and present, until the review copies started rolling in and suddenly poetry criticism had moved from the tastemakers of the printed journal for whom a bitter response would have to be typed and mailed to a web address wherein the reviews kept coming and the emotional responses and appeals to justice were immediate. Silliman’s continued attacks on what he termed the School of Quietude suddenly came at a time when the computerized poetry culture was wholly within earshot and the curiosity engendered led to a more amplified airing of his grievances and spontaneous disagreement, until he recently downplayed the phrase’s applicability to the present day. The blog has received over 2.5 million visits. 1. Benjamin, Walter, “On Some Motifs in Baudelaire,” Illuminations (Trans. Harry Zohn. New York: Schocken, 1968) 165. 3. Kenner, Hugh, The Pound Era (Berkeley: University of California, 1971) 184. 4. Sartre, Jean-Paul, “The Paintings of Giacometti,” Essays in Aesthetics (Trans. Wade Baskin. New York: Citadel, 1963) 55. 5. The Pound Era, 194. 6. Kai Yu Hsu, Twentieth Century Chinese Poetry: An Anthology (Garden City: Doubleday, 1963) xv. 7. Stein, Gertrude, Tender Buttons, 1. 8. 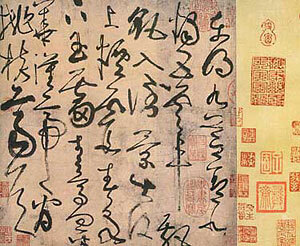 Fenollosa, Ernest, The Chinese Written Character as a Medium for Poetry (San Francisco: City Lights, 1991) 16. 10. Adorno, Theodor, “Parataxis,” Notes on Literature, Volume Two (Trans. Shierry Weber Nicholsen. New York: Columbia, 1974) 128. 19. Derrida, Jacques, Of Spirit (Trans. Geoffrey Bennington and Rachel Bowlby. Chicago: University of Chicago, 1987) 79. 20. Badiou, Alain, Conjunctions, (Trans. Steven Corcoran. London: Continuum, 2008) 39. 22. Lally, Michael ed., None of the Above: New Poets of the USA (Trumansburg: Crossing, 1976) 62. 23. Creeley, Robert, “On the Road,” Poets of the Cities: New York and San Francisco 1950–1965 (New York: Dutton, 1974). 24. Watten, Barrett, Frame (1971–1990), (Los Angeles, Sun & Moon, 1997) 68. 25. Creeley, Robert, Autobiography (Chennai: Hanuman, 1990) 94–5. 27. Silliman, Ron, The New Sentence (New York: Roof, 2003) 87. 30. Silliman, Ron, Under Abany, (Cambridge: Salt, 2004) 81. 32. Silliman, Ron, “Reading Ketjak,” Ron Silliman and the Alphabet (Santa Cruz: Quarry West, 1998) 50. 34. Silliman, Ron, The Age of Huts (Berkeley: University of California, 2007) 3–101. 36. Perelman, Bob, The Marginalization of Poetry: Language Writing and Literary History (Princeton: Princeton University Press, 1996) 68. “Thus ‘We ate,’ not babies, not port, not ambassadors, but only ‘them.’” p. 175 quotes Watten in the 1980 magazine Hills (ed: Perelman): “Each sentence is a device… this is close to Shklovsky’s characterization of Sterne. Ketjak is a typical novel in the tradition of Tristram Shandy.” By comparing not just Ketjak to Tristram Shandy but to Shklovsky’s characterization of it, Watten suggests that a lack of precedent for a structure isn’t the same thing as a lack of structure. 37. McCaffery, Larry and Gregory, Sinda, Alive and Writing: Interviews with American Authors of the 1980s (Urbana: University of Illinois Press, 1987). 38. Age of Huts, Preface. 39. Alive and Writing: Interviews with American Authors of the 1980s. 40. Age of Huts, 166. 43. The Age of Huts, 159. 45. Trotsky, Leon, “The Formalist School of Poetry and Marxism,” Literature and Revolution (Trans. Rose Strunsky. Chicago: Haymarket Books, 2005) 140. 47. Zukofsky, Louis, “About The Gas Age”, Prepostitions (Berkeley: University of California, 1981) 170. 48. Silliman, Ron, The Alphabet (Tuscaloosa: University of Alabama Press, 2008) 1. 49. Bernstein, Charles, Content’s Dream (Los Angeles: Sun & Moon, 1986) 314–9. 50. The New Sentence, 3. 54. Eagleton, Terry, Marxism and Literary Criticism (Berkeley: University of California, 1976) 20. 55. Silliman’s Blog, November 18, 2002. 56. Notes on Literature, Volume Two, 110. 57. The New Sentence, 4. 58. Barthes, Roland, “The Tasks of Brechtian Criticism,” Critical Essays (Trans. Richard Howard. Evanston: Northwestern, 1972) 74. 59. Literature and Revolution, 140. 60. Silliman’s Blog, November 14, 2002. 61. The New Sentence, 149. 62. Hegel, Georg Wilhelm Friedrich, Hegel: On the Arts (Trans. Henry Paolucci. New York: Frederick Unger Publishing, 1979) 161–2. 64. The New Sentence, 154.